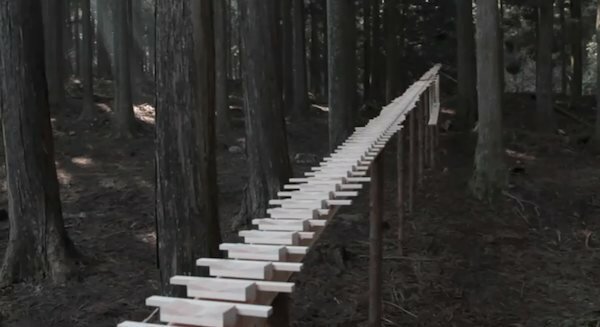 Here’s a clever and creative work of art consisting of a sloped, automatically playing wooden xylophone situated in an ancient Japanese forest. A wooden ball rolling down the length of the very long xylophone structure automatically plays Bach’s Jesu, Joy Of Man’s Desiring. Well ok, it’s actually a DoCoMo commercial for a mobile device partly made from wood. Can it be a work or art and an ad at the same time? Sure, why not? The tradition of artists making commercials as part of their work goes way back. Here’s a Len Lye abstract film from 1937 that was made in association with the British General Post Office, and then there’s Andy Warhol and many others. Drill Inc designed this huge musical instrument. From an environmental point of view, apparently all wood used was considered surplus from overgrown forests. I wonder what happened to the wooden instrument after filming? Was it left in the forest or dismantled and something else done with the wood? Incidentally, I doubt if the name of the phone itself, ‘touchwood, would ever be used in an English-speaking market. That would be rather amusing.